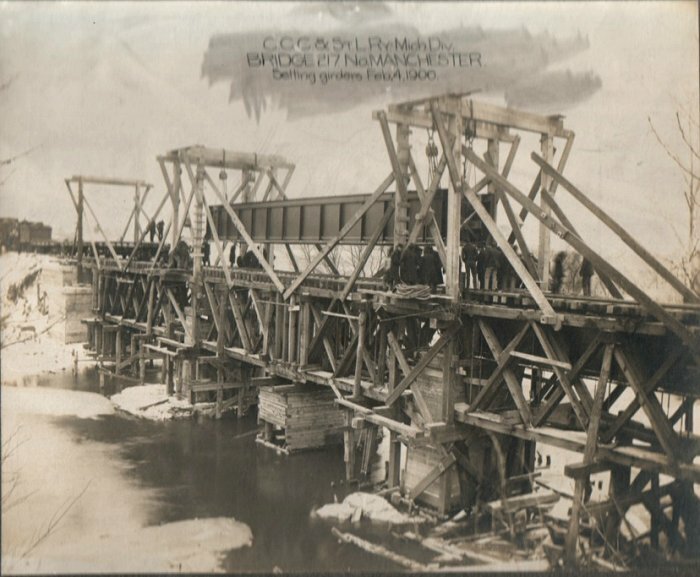 Looking at Larry Baggerly's photo of the bridge construction at North Manchester. I still am not sure about the direction but I believe it is south to north. If this is true, the water tank stood in the area where the picture was taken. A short story about taking water one dark night. If you look at the far end of the bridge where the last wooden frame work is located you will notice how the abutment steps down to the Ell River. The first step at the top is about 7 or 8 ft from the top to the first landing. Rarely did you go by this water tank without taking water and this night was not an exception. We were on #74 northbound with about 50 cars and this night Gabe Ginn, the engineer was going to spot for water without cutting away from the train. As Gabe was sneaking down to the spot I grabbed my flashlight and started down the left side of the engine to drop off and walk back to the rear of the tank and take water. The flashlight was in that little pocket on the right leg of the bib overalls that you use as a catch-all not only for the flashlight but a fusee or a pipe if you smoked one. When Gabe spotted he rarely missed but this was one of those times he did. As I started down the ladder the step lights were out and I couldn't see, so, knowing the edge of the bridge would be close when he spotted I stayed on the step until Gabe stopped. I had made it a habit to feel for the ground with my foot before letting go of the handrails in these dark situations. Feeling for the ground I looked down and we were past the edge of the bridge and with the little reflection from the firebox I could see the 7-8 ft. of nothing below. Gabe had missed the spot not more than 3 ft. and about that time Gabe yelled, "Don't get off, don't get off." Everything turned out ok but this shows just how quickly you can become injured. If Gabe had hit the spot, he only had about a foot either way from center on the spot. You had to be careful if the spot was perfect when you dropped from the engine. Of course when I returned to the engine I gave him my standard statement, "Are you getting so old that you can't spot for water? I suppose you are going to retire next week." This always was good for a grumble but we were both glad I had not let go.